Fitness and Lifestyle (Extreme Nutrition and Training Blog): Quick At-Home Fat-Burn Workout!! HAPPY NEW YEAR EVERYONE !!!!!!! I did the following 5 exercises one after the other with no more than 30sec rest between rounds: I typically aim for 3-5 rounds depending on how much time I have! This workout targets most major body parts and cardio which is great for getting a quick burst of energy and strengthening your core/upper body and sculpting the lower body! 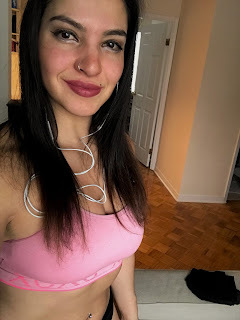 Years ago I wouldn't have been okay with skipping weight training at the gym followed by machine cardio.. but I am starting to realize you can get a decent workout at home; stress-free, and have also found that when I shorten my workouts I'm less hungry throughout the day so it's easier not to over-eat!!! Stay tuned for more workout ideas and nutrition tips ! !